Couch #23 belongs to Maura. She lives in an apartment in Hancock Park . Not everyone knows where Hancock Park is, so sometimes she just says Hollywood. Hancock Park is more impressive. When I used to live nearby in Hollywood, I used to say I lived near Hancock Park. Where I lived it was not quite as nice as this neighborhood. I wouldn’t have felt as safe parking my car full of stuff there. I also would have heard a lot more car alarms as I noted in the last blog. However, the fruit and ice cream vendors did come around that neighborhood and they don’t in Hancock Park. Oh, and there was the knife sharpening guy. Let’s not forget about him. The couch is from Levitz in Burbank. Before this couch Maura had a couch named “Purple Love” It was a plum, 9 foot, camel-backed, sleeper sofa and Maura loved it. It had to be moved in and out through her window and even that wasn’t easy. I believe it even involved the wall having to be cut into to get into the apartment. The current couch was able to fit through the door. Maura was doing okay financially at the time when she bought it, but could only afford to buy once piece of furniture at a time. At this point in her life she wanted to replace all of her IKEA furniture because she wanted to be a grown up. 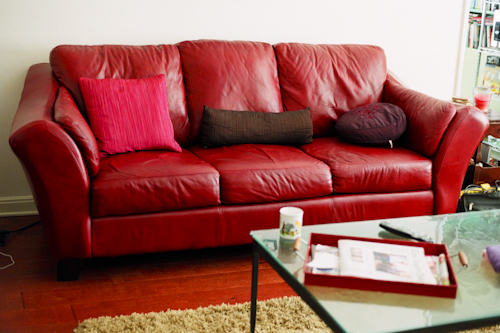 So, first, she bought this new red leather sofa. There was also a love seat and a chair that went with it and ideally that’s what she wanted to get. But then Levitz announced that they were going out of business. Maura then went back, but buy this point the had discontinued the rest of the set. Instead, she bought a love seat and chair that are chocolate in color. They don’t necessarily match, but they do blend well. She’s actually really glad that she got them, because if she had the all red set, it might look a little more “boudoir” in the living room than she would have liked. She loves the couch though. It is comfortable and it did pass the nap test. Maura doesn’t buy a couch unless she can lay on it and actually fall asleep in the store. If napping was an Olympic sport, Maura would totally medal. She is the Queen of napping. Maura is a High School Principal in Boyle Heights. At the time of this interview, Maura was in a 5 year relationship, but currently she is single. She is allergic is cats and dogs and is not home enough to be a good pet owner.